We all know boys and girls are equally intelligent and capable, but that doesn't mean they aren't different. Mounting evidence suggests that boys and girls learn differently and have different needs in the classroom. Research indicates that this is actually due to the way they are wired, and a trend of disturbing studies also show that this may be affecting their performance. Boys are lagging behind girls in many areas, including academic performance, discipline, and college graduation. 1. Boys need to move. Girls are auditory and verbal learners, while boys are spatial and visual learners who learn best from hands-on lessons. We also know that their energy levels need an outlet every day, which is why we require at least an hour of physical activity on a daily basis. 2. Boys value loyalty and teamwork, but they are also competitive. The military model, which enrolls boys in a Corps of Cadets and then assigns cadets to a "company" and within that, a "platoon," taps into boys' affinities for loyalty while also motivating them through healthy and controlled competition. Company competition measures progress and success in various areas - academic success, community service projects, self-discipline and athletic effort. Boys bond with their company brothers and develop a sense of pride and belonging. Our military-style education also teaches compassion in competition. The leadership tenants teach boys that their measure of success as leaders is in the way they encourages others to succeed right along with them - no man left behind. 3. Boys need frequent and consistent feedback. In our experience, boys thrive when they hear us tell them when they are doing something right and need instant on the spot correction when they're making poor choices. Fairness is high on the list of what is important to them, and they trust a system that is consistent and transparent. Our rule book is the same for everyone, and the boys all receive clear written descriptions of the expectations for their behavior and the consequences for not meeting those expectations. 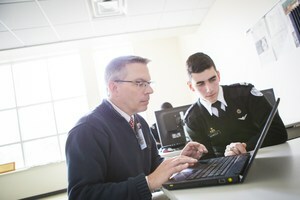 The military education program provides a system of promotion that regularly provides feedback in the form of rank and awards for effort and accomplishment, and opportunity for counsel and encouragement should a boy show signs of struggle. This also results in a program of positive peer pressure, where boys want to be part of the "in crowd" of motivated, successful students. 4. Boys need you to know that they are going to make a mistake. Mistakes are part of life, but that is especially true for young men whose brains and executive function are still in development. They naturally seek chaos and risk, so we provide those opportunities in a protected environment - rappelling down a 40-foot tower, crossing a rope bridge, or practicing a water rescue. In the event that a young man does make a mistake, our program provides opportunity for redemption while teaching him that there are consequences for bad choices. Working with boys for many years has prepared us to respond to mistakes or poor choices by teaching them how to get back on track. The "fall down 8 times, get up 9" theory is often repeated. 5. Boys need time. It's a marathon, not a sprint. The education of boys is a process, not an event. We understand that patience is our best ally when working with boys, and we always keep the big picture in mind in terms of our expectations for their success. A developing boy's performance can fluctuate from one day to the next, and we keep them focused on the end goal: to succeed in college and in life. Want to learn more? Talk to one of our enrollment counselors.